The process to obtain an Azure FedRAMP compliance is time consuming, manual, and paper-intensive. Until now! Introducing ATO as a Service™, an exclusive Software as a Service that automates Azure FedRAMP compliance, and shortens FedRAMP ATO timeframes for information systems hosted in the Azure Government Cloud. cFocus Software has partnered with Microsoft Corporation to develop ATO as a Service™, allowing us to tightly integrate best-of-breed Azure automation and continuous monitoring technology. ATO as a Service™ features a rich user experience that automates FedRAMP processes. 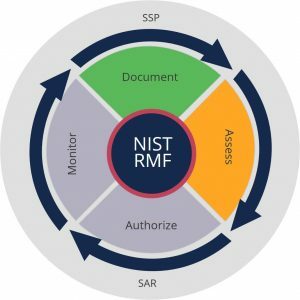 Each FedRAMP process area (Document, Assess, Authorize, & Monitor) is presented through a step-by-step wizard that incorporates all applicable FedRAMP/NIST instructions & templates, guiding you to completion. ATO as a Service™ allows you to collect all required FedRAMP data, and subsequently auto-generates authorization package documents (such as the System Security Plan, POA&Ms list, etc.) for you. Through our collaboration with the Microsoft Azure Blueprint program, ATO as a Service™ automatically pre-fills SSP security control responses inherited from Microsoft Azure P-ATOs for you. ATO as a Service™ also provides guidance on how to write a thorough and compliant response for security controls that are your responsibility. ATO as a Service™ automates the implementation of Microsoft Azure continuous monitoring tools and services on your behalf. Furthermore, our continuous monitoring dashboard provides operational visibility of security controls, manages system change control, and manages incident responses for your information systems. Want to learn more about ATO as a Service™ for Azure? Click below to set up a demo!